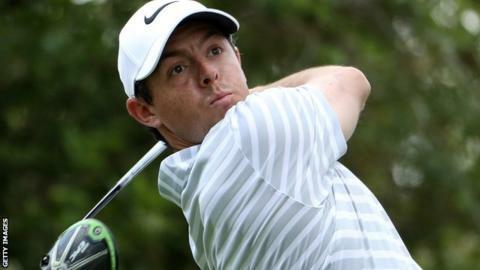 Rory McIlroy was knocked out of the World Golf Championship Match Play after a dramatic day in Austin, Texas. The world number two's scheduled opponent Gary Woodland pulled out of the event on Thursday because of "a personal family matter". That left Denmark's Soren Kjeldsen, who beat McIlroy on Wednesday, needing a half against Argentine Emiliano Grillo to eliminate the Northern Irishman. And the world number 68 recovered from a slow start to win 4&3. The Dane, who was due to face Woodland in his final group match on Friday, found himself two down after two holes but took control around the turn. "I'm very pleased, but actually not happy about what's going on with Gary," Kjeldsen said. "I don't know the details, but Gary is one of the nicest guys out here. So we wish him all the best, and his family all the best. "I was in a very, very, very tough group. And I got through that." Woodland's withdrawal came a day after defending champion Jason Day pulled out to spend time with his mother as she receives treatment for lung cancer. Italy's Francesco Molinari also withdrew with a wrist injury after suffering a 5&3 defeat by Thongchai Jaidee on Thursday. That meant Sweden's Alex Noren, who was due to play Molinari on Friday, was guaranteed to advance from group eight having beaten Austrian Bernd Wiesberger 3&2 to claim his second win of the week. Englishman Tyrrell Hatton also recorded his second win, beating Korea's Wang Jeunghun 2 up and can advance to the last 16 if he can get a half in his final group match against Spain's Rafa Cabrera-Bello. And another Englishman, Paul Casey, also continued his flawless record by edging out South Korea's Byeong Hun An 1 up. He now faces South Africa's Charl Schwartzel on Friday, with the winner going through. In contrast, Masters champion Danny Willett was eliminated with a game to spare after being thrashed 6&5 by American Bill Haas, while world number one Dustin Johnson made it two wins out of two by beating Martin Kaymer 3&2. Two-time Masters champion Bubba Watson also showed signs of a return to form with his second win, the left-hander beating compatriot Scott Piercy 4&3. Watson can book his place in the last 16 by beating Thomas Pieters on Friday after the Belgian Ryder Cup star lost to Venezuelan Jhonattan Vegas.